The December 2016 issue of Yachting Monthly pays tribute to the Skipper in style, although I should probably admit to a certain editorial bias here since much of the copy was written by me. In fairness, it also contains input from much greater men – Sir Robin Knox-Johnston, Roger (‘Mingming’) Taylor and Colin Putt – words drawn from their forewords to volumes in the new Tilman Collected Edition. 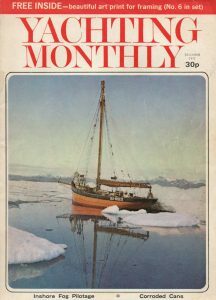 Ten years before the infamous 1982 editorial piece which sparked a lot of myths, bad feeling and one of the biggest irate mailbags that Yachting Monthly had ever received, they’d actually published one of my pictures as the December 1972 cover. The fee of £28 received was a serious windfall for this then young UCNW Bangor student, though the fact that they wrecked the original transparency in the process was less welcome. 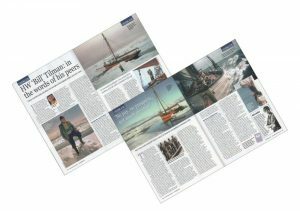 By the date of publication, Tilman’s second pilot cutter, Sea Breeze, lay wrecked deep in an East Greenland fjord and as soon as the magazine appeared in print the wife of the former owner demanded a print from Tilman whom she regarded as ‘a guilty man’. For the full story behind that, come and see the talk! Next date, Kendal Mountain Festival, 2016.